The process to create the cover art for The Legend of Light books would last weeks, sometimes months, as Pam and I went back forth slowly getting the technical parts of the images right, and the finer details akin to my vision. It was always a fascinating endeavor to see my characters gradually come to life, and also to see how another person interpreted my descriptions. No two imaginations are the same, so it’s always neat to see the unique view that one mind has in relation to another. Below, I have an abridged timeline of the process that Pam went through drawing the cover art for Book One in The Legend of Light, The Echoes of Light. This cover features the series’ main character, Alamor, a young swordsman with an innate magical ability that he just can’t seem to gain control over. This was the very first sketch that Pam whipped up. It was the blueprint for the entire process, establishing key elements such as the perspective, Alamor’s stance, the placement of his limbs, and the overall shape of his body. 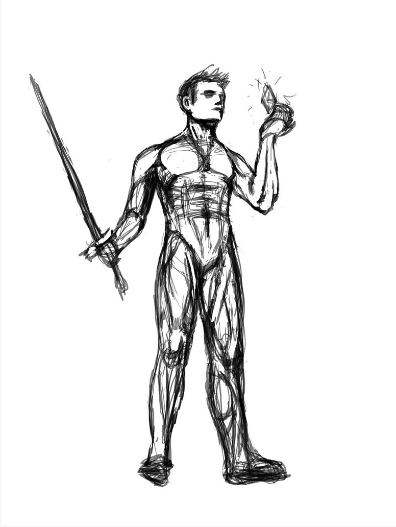 What I always found neat was that Pam took the time to sketch out the muscles of Alamor’s body, despite that they would never actually appear in the image, as he’s wearing armor. Clearly, attention to detail, even if those details are ultimately trivial, goes a long way toward an artist figuring out the big picture. In this step, Pam adds that aforementioned armor, along with some other details, like Alamor’s cape, and the symbol on his breastplate. That symbol is very prominent in The Legend of Light’s story. It’s the emblem for the Hokara royal family, the rulers of the land of Tordale. 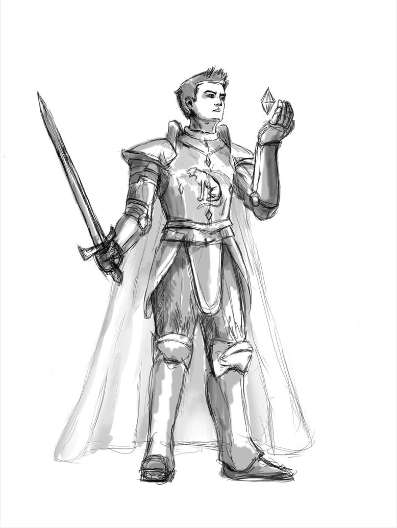 I was very pleased with the overall shape of Alamor’s armor; its sleek, but still appears sturdy, allowing Alamor protection without looking like it would be cumbersome for him just to lift an arm. Funny enough, I mentioned to Pam that I particularly loved this image because it evoked images of Manga to me, which I felt because of such details like the black/white coloring, the 2D textures, and the sharp lining. Pam flat out said that she didn’t understand where I got that sense from. It really goes to show how rudimentary my knowledge of art is compared to a skilled, experienced practitioner. There are a few big developments in this image. The first, and most obvious, is the introduction of color. 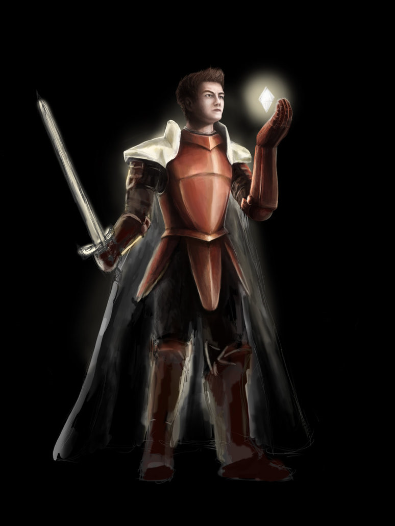 Alamor’s armor takes on a crimson shade, while his shoulder plates are a gleaming white. I admit that Alamor’s character is somewhat based on myself, and the color combination of red/white is very special to me, due to my Polish heritage. 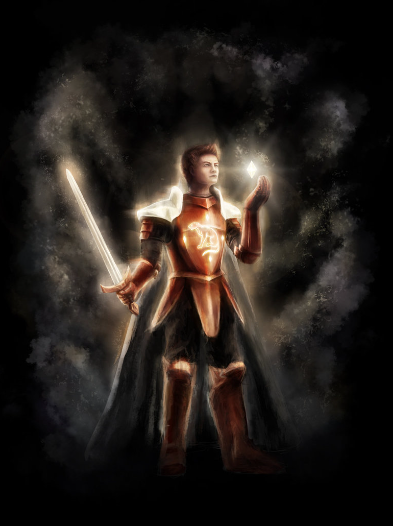 Alamor, himself, is less flat in this image, as textures become a little more round, notably over his armor and his face. You also might notice that the perspective is slightly changing by this point; with the original sketch, it felt like the viewer was looking up at Alamor, while, here, Alamor is becoming more eye-level, and moving further into the background. The symbol of the Hokara royal family makes its return in this step, complete with plenty of light. No surprise, the art for a series named The Legend of Light was going to feature radiance over its characters. 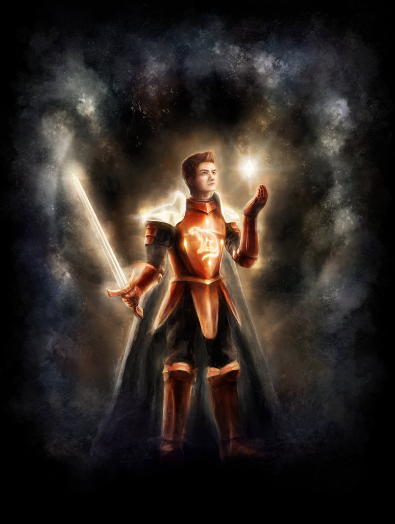 The diamond-like object in Alamor’s left hand, a vessel of supreme magic called the Radia of Gallantry, is bursting with light, casting a glow over his armor and his sword. All of this light stands out against the primarily-black background. That background starts to get some details here, however, as Pam adds clouds and fog behind Alamor. I always had the idea of the background being “space-like”, as I described it to Pam. I wanted it to feel like Alamor was standing in the middle of an other-worldly setting, with masses of space dust billowing behind him. As you’ll eventually see, Pam really nailed that concept. Here we have the finished product, where the light become precise around the contours of Alamor’s body. That “space dust” behind him is far more prominent, and Pam has added a soothing, bluish-grey color that makes it feel very supernatural. She did a couple versions where the space dust was a different color, such as pink, and purple, but I felt the bluish-grey was most appropriate for Alamor. Those different color ideas would later be used for the other covers in the trilogy. You also can see a halo take shape behind Alamor, which is an element that Pam often adds to her artwork. As she described, the background would be a little nondescript without it, but most importantly, the halo adds a sense of power to Alamor. It emphasizes him, making him feel heavenly. If you enjoyed this look into the process behind The Echoes of Light’s cover art, check back here in the future, as I’ll post similar features showing the process that Pam and I went through for the other covers in The Legend of Light trilogy. The Echoes of Light is tentatively releasing May 18th with Amazon, and will be available in both print, and in digital formats with Amazon Kindle. Head on over to Facebook and ‘Like’ its official page to see more original art and other behind the scenes details. Anyone who ‘Likes’ it is also qualified to win a free copy of Book One, The Echoes of Light. And if you enjoy Pam’s wonderful artwork, I encourage you to pay a visit to her personal website or any of her social media channels!